Meet Leigh Walmsley from Warrington, Cheshire. 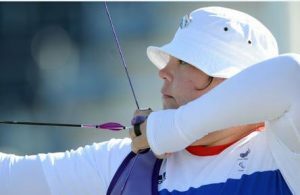 Leigh represented Paralympics GB in archery, at the London 2012 Paralympics and has experienced the pain of arthritis since her 20s. I developed osteoarthritis after a serious cycling accident aged 11, but noticed the first signs of inflammatory arthritis in my 20s. Initially, I thought it might be due to unsupportive footwear, being on my feet too long and repetitive strain injury from keyboard use at work. Living in London at the time, I put up with it for years until one day I approached my GP. I had a very good rapport with her, so she referred me to a rheumatologist immediately. My rheumatologist was also fantastic, running tests but also listening to me, because he said ‘labs don’t show the whole picture’. To manage the pain, I was advised to take high doses of ibuprofen at the time, but progressed to a variety of pain medications over the years. I must admit to being in pain every day, to some extent – and it can be very severe at times, as I also have neuropathy and fibromyalgia. The impact arthritis had on my life was very significant. I don’t go out to socialise very often these days as my walking can be limited and at times my shoulders are so restricted that I’m unable to do archery. In my experience, the fatigue of chronic pain is debilitating. “But you don’t look sick” is a comment I hear often, but in my experience, arthritis can be isolating and lonely. One year since I competed for Great Britain at the London 2012 Paralympics, the participation rules were rewritten and many invisible conditions were dropped from the Paralympics, which was a big shock. Looking for support, I came across Arthritis Action on Twitter, with a fantastic mission for health and wellbeing for arthritis and immediately decided to get involved. Just knowing there are people out there who understand what we’re going through is enough to raise your spirits! Arthritis Action’s support has been fantastic! At my first AGM in 2015, it was amazing to be in a room full of people who “get it” – I was so inspired, I decided to start a support group in the North West. Just knowing there are people out there who understand what we’re going through is enough to raise your spirits! Being able to get stuck in and start an Arthritis Action Group in my area will not only be a boost for me, but for my local community. Through the years I have learnt that certainly taking up a sport has helped my arthritis, but I must pace myself or it backfires on me. I find regular massage and physiotherapy very beneficial. I don’t follow an arthritis-specific diet, but am a big fan of veggies and don’t eat red meat. I have always been a glass-half-empty person, for as long as I could remember, but I worked with a psychologist when I was on the archery team who showed me how much better positive thinking is! Being creative is a fabulous way to relax and recharge your energy. It is difficult putting a happy face on, but I don’t want arthritis to rob me of everything, so I push through it for better or worse. When things get tough Arthritis Action is always at the end of the phone, email or social media. They’re empowering me, so I can empower others – it’s a win-win situation! For the future, I’m hoping the Group grows from strength to strength and the Paralympics rule change in 2017 will allow me to reclassify, so I can try for Tokyo 2020 and represent not only GB but everyone living with arthritis!